I just finished this special little lady. 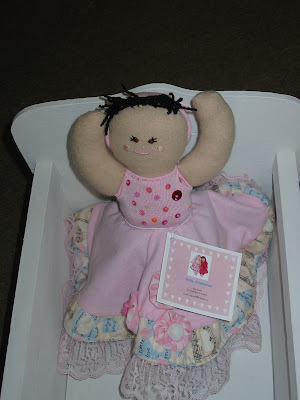 Her body is 100% wool, her legs are of wool suiting and she is stuffed with lamb fleece. The fleece is from a sheep farm in Danville, Vermont, very close to where I live. 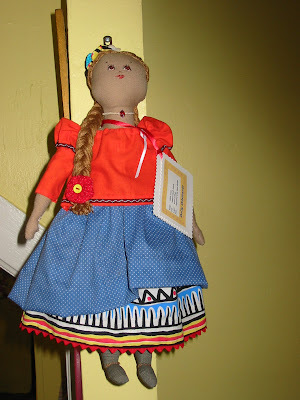 Her braided hair is made from imported Irish linen thread. The topsy-turvy girl (girls?) pictured below is my version of this picture. 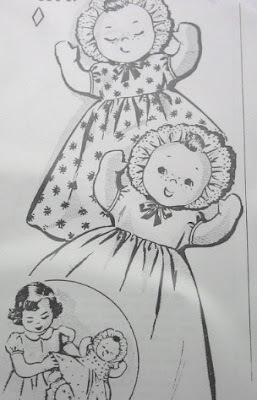 I am not sure where I got the pic, I believe it is a photo I had of a vintage pattern. It inspired me as you see. No, you are not looking a two dolls. You are looking at one cute topsy-turvy. I do have to tell people to turn her over. Sometimes they miss little girl number two, even when holding her. I had so much fun sewing this duo and decorating the clothes. Their bodies are made out of soft cotton flannel. I wish I had taken a close-up of their outfits, but I think if you click on the picture it will give you a large view. 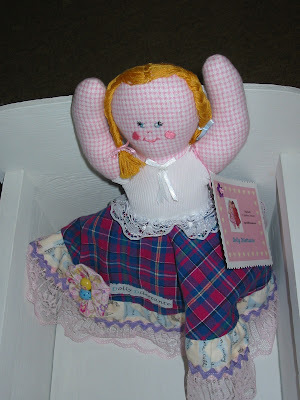 The yoyo flower on the plaid skirt has the most adorable button of a baby doll sewn on it. You invited me to visit you for a week, which means that I would be near my daughter, whom I adore. You who live with her know how rarely I see her, how much her presence delights me, and I am touched that you should ask me to come to see her. All the same, I am not going to accept your kind invitation, for the time being at any rate. The reason is that my pink cactus is probably going to flower. It is a very rare plant that was given to me and I am told that in our climate it blossoms only once every four years. Now I am already a very old woman, and if I went away when my pink cactus is about to flower, I am certain that I shouldn't ever see it flower. So I beg you, Sir, to accept my sincere thanks and my regrets, together with kind regards. My Victorian cloth doll, a little maid from Godey's Ladies Magazine, 1861. More pics to come of how I made her! Hi from Meg. 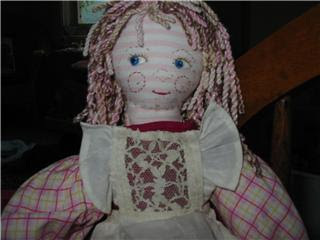 I make vintage dolls, quilts and other hand crafted items and I have a brand-new business, "Dolly Dilettante." It was born July 2007 from a hobby I love. Jean Elizabeth's Soap & Co. This is a Flickr badge showing public photos from megjewell49. Make your own badge here. Guess What I Made Today! I am a blog dummy!